A derby win that seemed too far, the single goal was truly bizarre. Defeat in Paris leaves Liverpool down, Champions League qualification seems well out of town. An ex-player blasts a PSG star, his play-acting deserving of an Oscar. The Good, The Bad and The Ugly. Another week reviewed at the world’s favourite football club, Liverpool FC. The win against Everton on Sunday in a full-blooded derby match. Liverpool secured all three points with a win that was as fortunate as the winning goal was bizarre. 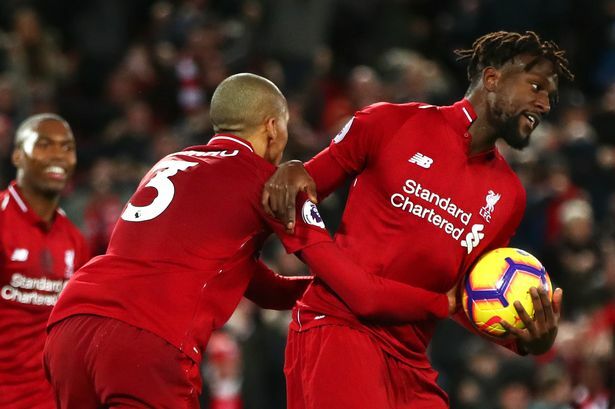 Divock Origi was able to head the ball home past a floundering Jordan Pickford. The Everton keeper having made a hash of trying to catch a mis-hit shot from Virgil van Dijk, that bounced twice off the crossbar in calamitous fashion. It gave Liverpool another three points which they seemed intent on sharing with their visitors. Sadio Mané was particularly wasteful with at least three guilt-edged chances in a game that saw the momentum swing one way and then the other. One has to feel for Everton as they gave as good as they got. Again, goalkeeper Alisson came to Liverpool’s rescue with two world-class stops in the first half to keep the hosts in the game. Jürgen Klopp lost control of his emotions when his men were gifted the win in the 96th minute, following four minutes (yes, four minutes) of added time. The German ran onto the pitch in unbridled joy to celebrate their win – or fortune you could say. José Mourinho would have been straight on the blower to the “powers that be” had he seen that. He would be before the naughty-boy committee quicker than you can say “water bottle” had that been him. In fairness to the Liverpool boss, he went straight to Marco Silva to apologise at the final whistle. No less than expected. Liverpool have won the Merseyside Derby after a calamitous error from Jordan Pickford in injury time! Divock Origi is the hero! The midweek loss to Paris Saint-Germain in the Champions League. What a God-awful performance that was. If that was a meal in a restaurant, you’d have sent it straight back. Not that there’s a fly in the soup but just for being totally insipid. Liverpool were just not at the races. They tried. A lack of effort is never something you could throw at this Reds team. They were just outthought, outplayed and outsmarted. PSG manager and also former Borussia Dortmund boss Thomas Tuchel must be sick and tired of losing to his compatriot. He likely told his players not to return to the dressing room without a win. The result now leaves Liverpool with the very tough task of beating Napoli by more than two goals to go through to the knockout stages. The saving grace is that this game will take place at Anfield and we all know what that means. The last chance saloon, a must-win game in the Champions League. A packed Anfield and unsuspecting visitors. This wouldn’t be the first victory at Anfield in such circumstances. Another ex-player speaks out. Jamie Carragher expressed his disappointmentat the antics of Neymar during the game. “… watching him was embarrassing” said the former Liverpool defender. Before going on to say “It leaves a sour taste in the mouth…” he’d clearly saw the similarities in Liverpool’s performance as I did. Personally, I agree with van Dijk who said Liverpool were given a lesson in European footballby PSG. At least someone saw it for what it was. It’s sad but true. I can’t think of a successful team that hasn’t had a player or players that can manipulate the referee. I think pretty much everyone in World football can appreciate Robbo here….. This same Reds team fell foul of Sergio Ramos and his antics during the Champions League final last season. And still, they complain. Is there not a recurring theme here? It’s an awful truth but this is a part of the game. Liverpool need to get “cute” if they wish to achieve their ambitions. The Bible says: the meek shall inherit the earth, but do you know what? We’re still waiting. I’m not sure that expression was meant for the final of a major football competition. The time has come for Liverpool to wake up and smell the coffee. On many occasion, the good guys don’t always win. Sometimes you need to pull a little trick here, and a little trick there. PSG did that because they felt that on “pure” footballing alone, it wouldn’t be enough. Up next we the team travel almost the length of the country with trips to Burnley on Wednesday and Bournemouth on Saturday.